The most recent California marijuana laws (Prop 64 and Masure M) set to allow for recreational purchases throughout the state. Since January 1, 2018 will mark the first time that anyone will be able to legally purchase recreational cannabis in California, it’s a perfect time to reflect on the past 21 years that California has permitted the use of medical marijuana to its state’s residents. We’ve provided an infographic below showing the history of California marijuana laws. If you are looking to order recreational marijuana in California, WoahStork’s online cannabis marketplace takes care of everything so you can order just like Amazon! You should notice a common theme when reading through the legislation that has supported California’s legal marijuana program: the “law” often times confusing and in relative disarray with little-to-no formal guidance on how to remain compliant. Unfortunately, California seems to be making a lot of the same mistakes; residents, business-owners, and even lawmakers seem to be very confused in regards to what exactly is going to happen with the latest in California marijuana laws: Proposition 64 and Measure M which allow for recreational cannabis to be bought, sold, and grown in California. 2007 – Citing an unruly proliferation of pot shops — 185 registered at the time — LA City Council’s first Interim Control Ordinance (ICO) goes into effect, which mandated a moratorium on new pot shops until the city could come up with zoning regulations to govern them. 2010 (January) – LA Council adopts a zoning ordinance specifying where pot shops are allowed in the city, raising taxes on receipts and limiting the number of dispensaries to 70, among other restrictions. 2010 – The city was subject to an “explosion of lawsuits” in response to the complex restrictions council adopted earlier in the year. 2011 – In a municipal election, voters pass a measure allowing council to enact a half-percent city tax on dispensaries and impose other regulations. Marijuana legalization activists challenged this in court as well. 2012 (September) – After several conflicting decisions by different state courts, the Los Angeles City Council votes to ban dispensaries outright in spite of fierce opposition. City officials cited “federal preemption.” This means the city was worried it could be penalized by the federal government, which as of 2017 still considered marijuana an illegal Schedule I drug, as dangerous as heroin with no medical benefit. 2012 (October) – The 2010 ban never goes into effect; activists mobilize enough opposition to convince the council to overturn the ordinance, instead capping the number of dispensaries at 135. 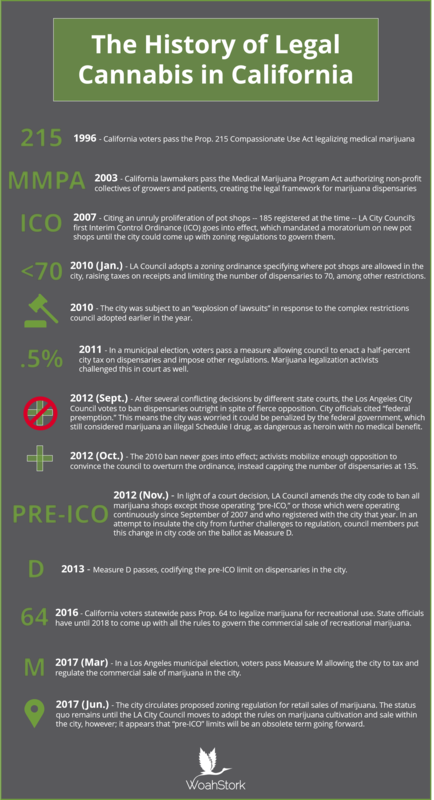 2012 (November) – In light of a court decision, LA Council amends the city code to ban all marijuana shops except those operating “pre-ICO,” or those which were operating continuously since September of 2007 and who registered with the city that year. In an attempt to insulate the city from further challenges to regulation, council members put this change in city code on the ballot as Measure D.
2013 – Measure D passes, codifying the pre-ICO limit on dispensaries in the city. 2016 – California voters statewide pass Prop. 64 to legalize marijuana for recreational use. State officials have until 2018 to come up with all the rules to govern the commercial sale of recreational marijuana. 2017 (March) – In a Los Angeles municipal election, voters pass Measure M allowing the city to tax and regulate the commercial sale of marijuana in the city. 2017 (June) – The city circulates proposed zoning regulation for retail sales of marijuana. The status quo remains until the LA City Council moves to adopt the rules on marijuana cultivation and sale within the city, however; it appears that “pre-ICO” limits will be an obsolete term going forward when it comes to California Marijuana Laws. Alcohol vs Weed: How do they work? Recreational Marijuana in California: What Are the Rules?